_ _ Lazy food is just the best. Food that you can throw together and look like you’ve spent time preparing it, while really you just sat around in your pajama jeans and caught up on True Blood… This post is not autobiographical. 1. Slice the tomatoes in half, lengthwise. Lay them seed-side up on a cookie sheet lined with parchment paper. 2. Sprinkle a little bit of salt and pepper (to taste) over the tomatoes and then drizzle them with a little bit of olive oil. 3. Bake on the middle shelf of the oven for 4 hours. 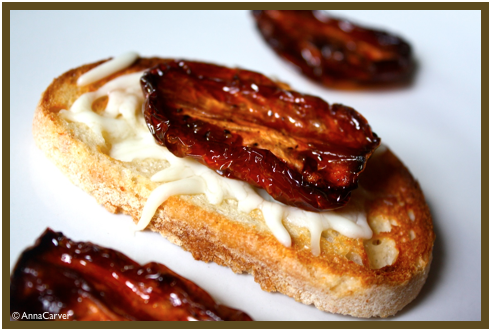 Serve on toasted artisan bread with shredded and melted mozzarella.